But the divide has always been about more than blocksize. The underlying priorities of the two camps are fundamentally different. Bitcoin (Segwit) prioritizes the importance of Bitcoin as a store of value, and believes on-chain scaling would lead to undesirable centralization. Bitcoin Cash, on the other hand, prioritizes the use of Bitcoin as a payments system, and believes on-scale solutions are best for achieving that goal. In a sense, the two coins are no longer even competitors — they now have different goals. Bitcoin, of course, originally began as a “peer-to-peer electronic cash system,” and there is still a need for a cryptocurrency to achieve that goal. Is Bitcoin Cash the fulfillment of that original vision? Or are there any other cryptocurrencies competing with Bitcoin Cash in that respect? Before merchants and users who want a crypto-based payments system move from Bitcoin (Segwit) to Bitcoin Cash, two other coins should be considered as well: Litecoin and Dash. Both coins are Top 10 cryptocurrencies, both have been around for years, and both desire to be a payments system like Bitcoin Cash. It would be helpful to compare these three cryptocurrencies, along with Bitcoin (Segwit), to see how they size up. Note: no matter which coin you currently prefer, there is no question that competition is good, and having such a competition will only help achieve the goal of a global crypto-based payments system. 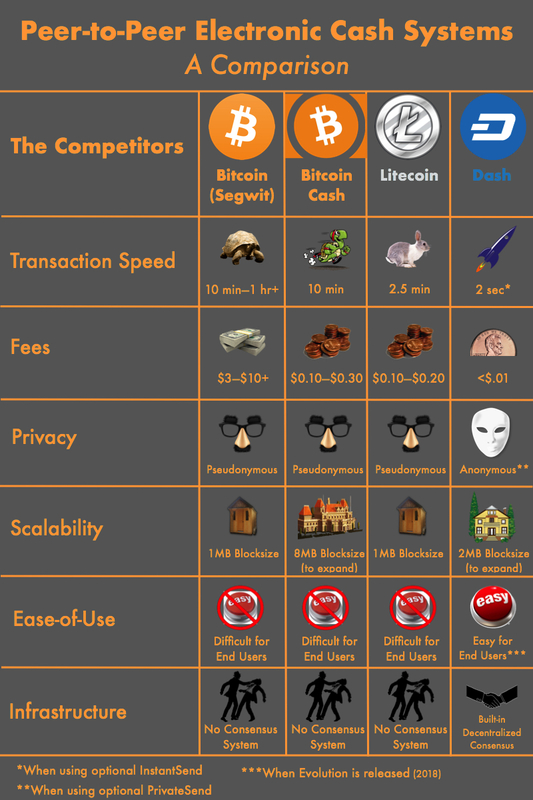 For purpose of this comparison, I’ve selected what I believe are the most important features for a peer-to-peer electronic cash system. They include: fast transactions, low fees, privacy features, ability to scale, ease of use, and the ability to develop and add features in the future. Let’s look at those primary features an electronic cash system needs to be successful.